Happy Monday lovelies. I hope you had a lovely weekend. I know this weekend was just what I needed. Unripened is gorgeous! I don’t think the photo’s do it much justice to be honest but if you look at the bottle you will see what I am talking about. This is two coats with no topcoat. Unripened is a black base with blue / teal glitter. In the first photo the bottle looks like it has a purple glitter too but that is how it changes in the light. This is gorgeous. If you read my comparison post between Stormy Sky, Miss Universe and See you Soon, you will notice this is fairly similar. The glitter here is a bit different. Let me know if you want to see a comparison post between this and any of those. This is two coats with no topcoat. Nevermore is a deep purple with blue undertones packed with glittery shimmer. It is so gorgeous. It will also change in different light between more purple and more blue. I just know this one is going to be a firm favourite with many people. This is two coats with no topcoat. Sanguine is a dark, vampy burgundy red with shimmer. These photos do it absolutely no justice. This is a gorgeous polish. 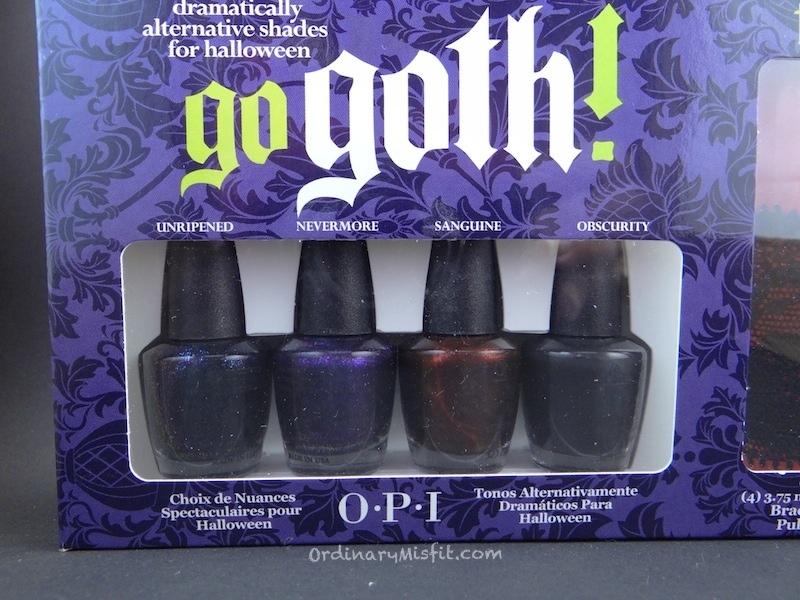 If you like the dark vampy colours then this will be perfect for you. Oxblood red has also been hugely popular in winter and autumn and I now really understand why. This is two coats with no top coat. Obscurity is a matte black polish. Due to the matte finish it almost appears more like a charcoal grey colour. Even though I love this, I had a really hard time with application. You can see how poop my application was here. I am mostly convinced it is due to the mini bottle and brush. I really don’t like the OPI mini bottles. Anyway, this is a really pretty polish and I will be trying it again soon to try and improve the application. I really love all of these polishes (Thanks SO much Thea!!!!). They are all gorgeous and dark and vampy. I love it. This is the third set of OPI minis I have and I am still not impressed with the mini bottles and brushes. It’s all me though and has no reflection on the polishes. What do you think of this set? Do any of these polishes stand out for you? Have a favourite? Have you used an OPI mini bottle and how do you feel about it? I would love to hear what you think. They are gorgeous. Love the mini sets colours. Thanks Lynette! They are very! Thanks Sharon. If she likes dark colours that aren’t black you should have a look at Sinful Colors. They have Calypso, Winterberry and Fig which are all dark colours but not black. Thanks so much for reading! Too gorgeous! Yes I agree, it is definitely the easiest way of getting a few colours but man those mini bottle are the pits. The brush is just off. 1. Favourite: Sanguine. Which is odd for me because I barely wear or buy dark colours. 2. Yes I also had application probs with mine when I was testing it all out. The bottles are just rubbish. Long brush, short bottle, just no. 3. I like the matte on you hey. You nailed it re the brush. urgh! Aw, yay, what a nice gift! Those bottles look so cute, but I’ve heard bad things about them. I love dark colors. Dark or bright, haha. I think I like Unripened the best, but colors like Sanguine were some of my first polish loves. Gorgeous gift. I am such a lucky girl to get so spoilt! Dark colours are so gorgeous and lately a few people have told me they really suit me so now I like them even more 😛 I love unripened! Sanguine is gorgeous too but Unripened is soo beautiful! Beautifully swatched! Funnily enough, I loved Obscurity but I think it’s just because it looks chalky when it dries and makes me want to draw on it! Lol hmmm, now I need to find a way to play with the other 3. They look stunning on you! I love obscurity too. I just didn’t love the application because of my small-brush struggles. It definitely was the one I couldn’t wait to try.